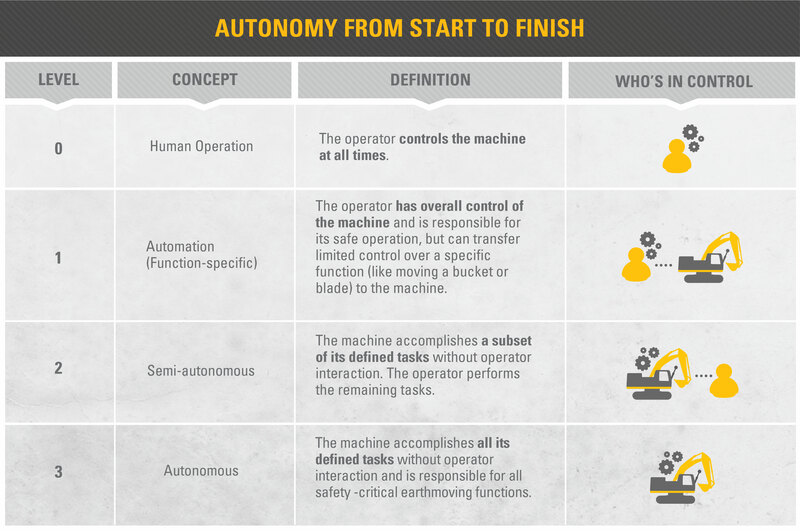 AUTOMATION & AUTONOMY: WHAT’S THE DIFFERENCE? Google is making headlines with its self-driving car. Automakers are moving in that direction too—adding driver-assist features that automatically control braking, lane changes, travel distance, parallel parking and more. But as talk about driverless cars moves into the mainstream, the language can get muddy. What some people call AUTONOMY others label AUTOMATION—and vice versa. Even around Caterpillar we’ve been known to use the words interchangeably, creating confusion for customers, suppliers and co-workers. To improve consistency, we’ve defined these terms below. Automation: a noun | refers to a set of related functions performed automatically by equipment. Automation assumes that the operator performs any requirements before or after the automated sequence in order to complete the task. Multiple automation sequences are required to enable equipment to work semi-autonomously or autonomously. Semi-autonomous: an adjective | describes multiple automated sequences a machine can perform without human input that result in a task being completed. Semi-autonomous machine operation assumes that the operator performs some tasks. Autonomy: a noun | refers to a state of equipment in which it can perform the programmed operations under defined conditions without human input or guidance. When we talk about this type of equipment, we use the adjective, autonomous. For example, some mines run autonomous trucks. If technology concepts are unclear to you—and that makes you uncomfortable—you may be less inclined to explore the alternatives with your equipment supplier. As a result, you may miss opportunities to improve safety, efficiency and profitability. So get familiar with the language and keep an open mind about change. 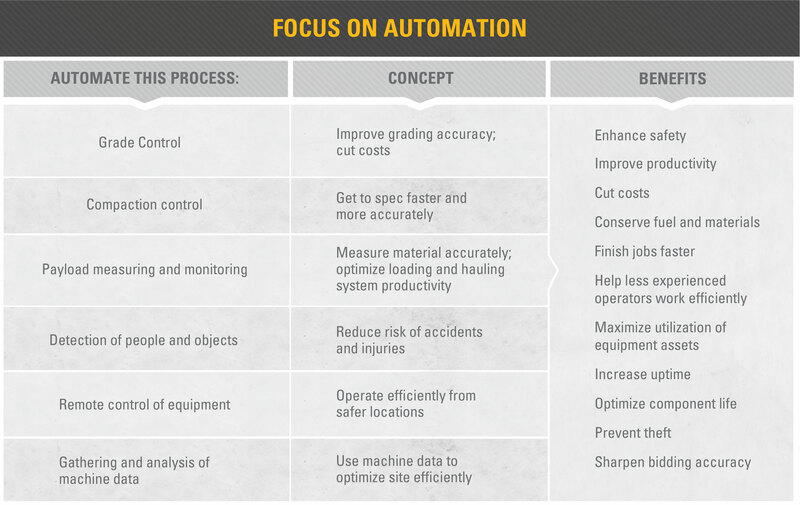 But as you look ahead, our advice is to learn about AUTONOMY, while focusing on AUTOMATION. AUTONOMY is real and it’s coming. But not for a while. And not to every site. AUTOMATION is here. Right now. Ready to deliver big gains to your business. Where will you devote your attention and resources?